Let me start with this statement - one will never truly appreciate the presence of an epidemium in the garden unless one plants one in the ground and waits 3 years. There are reason why we have passed them over at nurseries or in catalogs, either the flowers are oddly spider like, or the potted specimens looks less-than-exciting, but see one established in a garden, and suddenly they move to the top of ones must-have list. Few see specimens in our garden without asking "wow, what is that?". 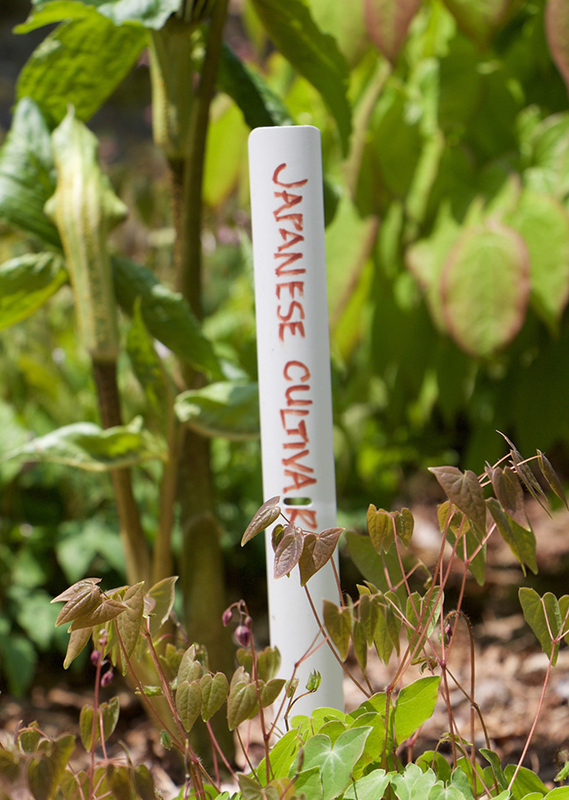 In the garden, a rather un-exciting 2 inch pot of these special epimedium species transform into spectacular garden plants. Today, Joe and I visited our long time friend and nursery owner ( and neighbor) Karen Perkin's owner of Garden Vision Epimediums located in Phillipston, MA. Nurseries like this one are rare, dedicated to just one genus, but with a breadth of selections which can impress any plant enthusiast. Garden Vision Epimedium's is the love child of both world renown epidemic collector and breeder Darrell Probst and Karen Perkins, the nursery features many of the Epimediums Darrell had collected in China as well as most of his hybrids, and there are few places on Earth where anyone can find these. I think most people don't know that before 1997, there were only a handful of species and named selections available. I urge you to check out their web site and see what delights await. 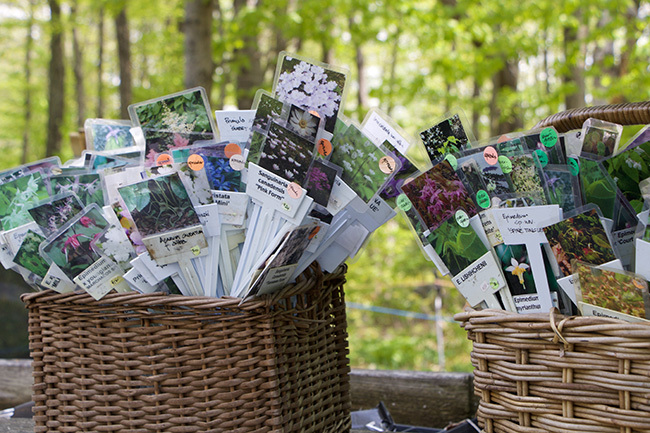 Name tags currently un-used rest in baskets at Karen Perkin's Epimediu Nursery. Look at how many varieties and species there are! 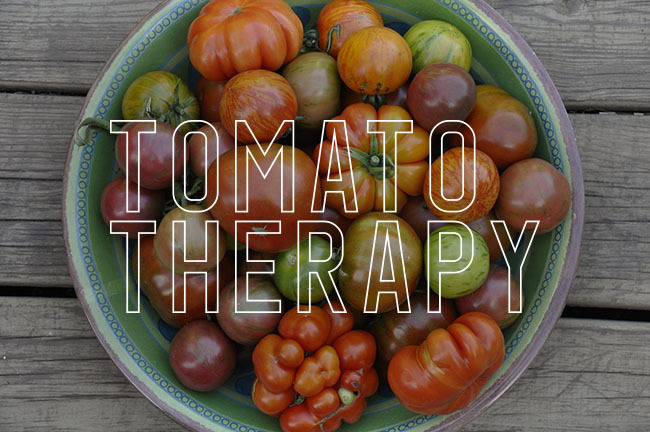 You may be wondering why these particular varieties are not available at your local garden center? There are a few reasons why, but the answer may not be what one typically hears (that they are too tall for the shelves at a Home Depot - which some are, or that they are not in bloom at the 'right time of year' - which they are, since they bloom in May and June), for our dear little epimedium loathes containers and especially small pots. The flowers can be lovely, but often, it is the foliage which makes epidemic such valuable garden plants. Epidemium, at least the really good varieties and species may always be difficult to find - the woody rhyzomes creep just under the surface of the ground ( like may of those plants within the genus Berberidaceae like Podophyllum), which by itself means that this horizontal habit is rather unforgiving for those who require Mass Market practicalities such as fast propagation and large numbers of pots in small spaces. 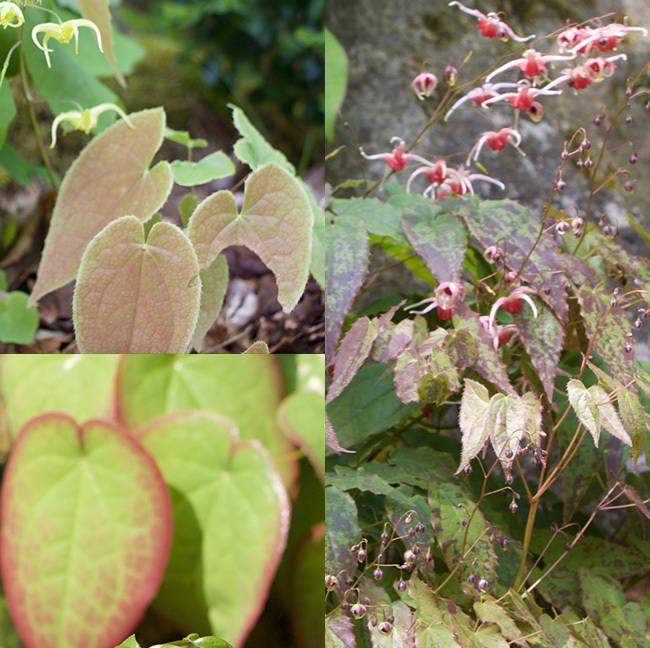 Our epimedium deficiency can be blamed somewhat not on bad PR, but on practical marketing weaknesses such as not being photogenic and what marketers call 'poor shelf-presence'. Epimedium x 'Pink Champagne' came home with me. Can you tell why? 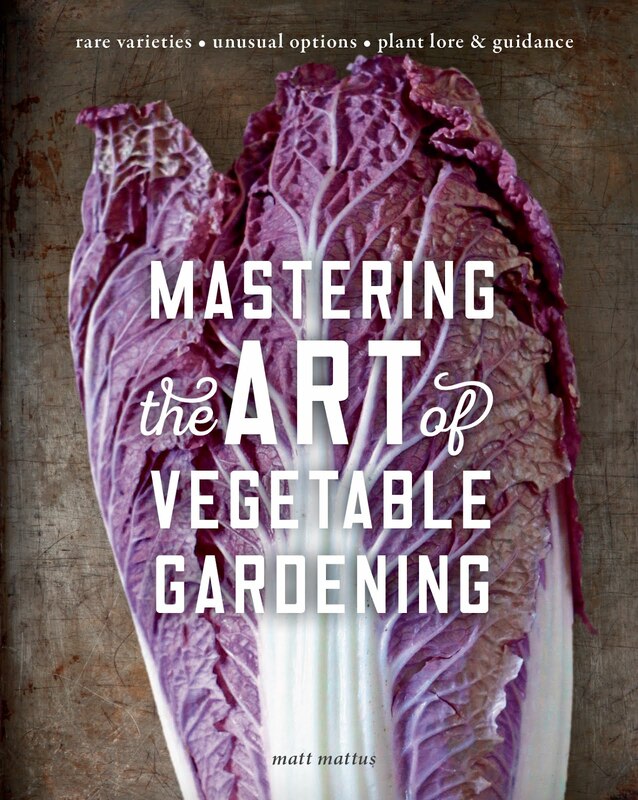 When I spotted it in Karen's garden, I was struck but it was a little expensive. But when she shared with me that this was one which Darrell feels is the most beautiful one that he has ever raised. Needless to day, I had to get it. 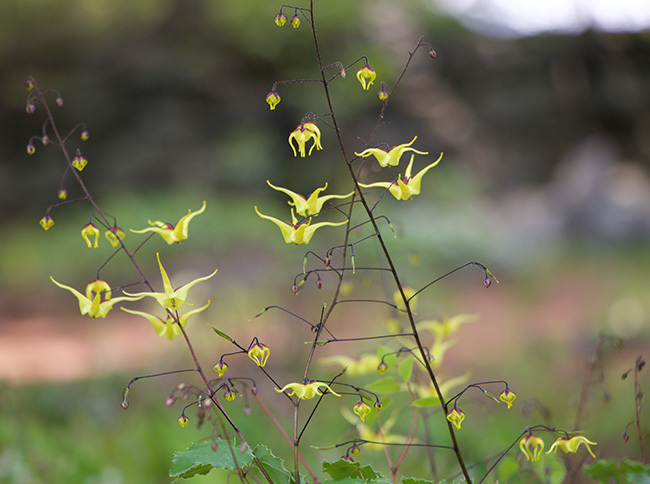 And that is the burden all epimedium must face - that their shelf-presence may be ineffective, yet their garden presence which is often highly spectacular. Add it up: Epimedium are long-lived, form dense, tight mounds of foliage which look nearly like a small shrub in some selections, or a nice, dense ground cover in others, they have variable foliage often with colorful spots, dark edges or reddish highlight, they have delicate clouds of blossoms in spring, which alone, should make any plant move to the top of a woodland gardeners list, but there is more. I never counted how any varieties were both being tested or trailed at Karen's, but I did notice some which may not even be introduced for a few years. 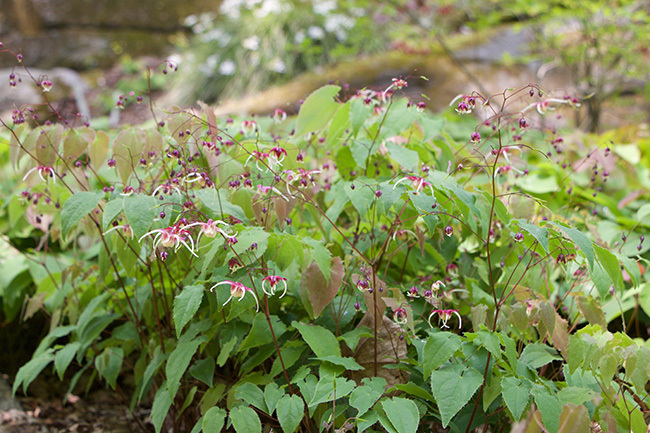 Darrell Probst may have move on to other genus and species to hybridize (like Gentians and Coreopsis), but his original passions for epimedium lives on here. If Karen ever decided to not run this little nursery someday, many of these species and crosses may be lost once again, forever. It's a fragile scarcity which should motivate us to support as these unusual and lovely species may always remain rare. Epimediums are terrifically hardy and the spread -not ever-so-slowly, but enough that places them in the "I really never have enough of them" category, but not nearly as slow as the ' I wish it would divide eventually (like a good trillium). 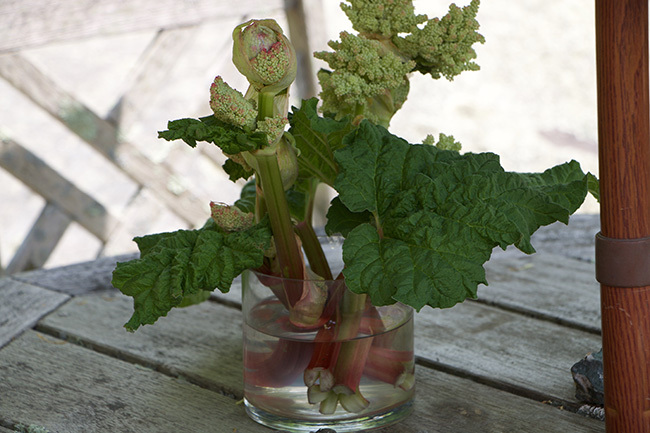 It's the sort of plant that once you have one, you are so impressed, you come back for more. Epimedium x 'Pink Champagne' in the garden. For some reason, Epimedium are like me - cursed with the burden of being difficult to photograph well. 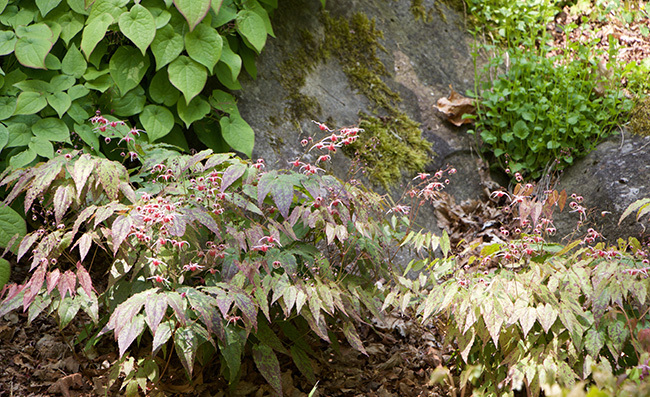 Although epimedium may never be 'popular', they are treasured garden and open shade perennials. I asked why many of these species and selection which we saw in Karen's display beds in full bloom were not often seen on nursery shelves, and the answer kind-of explains the challenge some plants have. 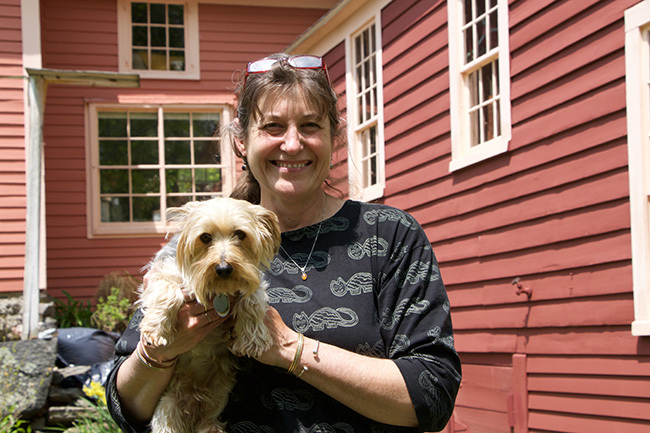 Karen Perkins, in her garden. We've been friends for over 30 years now, which is a little shocking now that I think about it, but yes, time flies by. We reminisced about our early days working together at the Worcester County Horticultural Society at Horticultural Hall back in the mid 80's (now Tower Hill Botanic Garden). Enter epidemic culture a little informed - first, they are technically woody in nature (well - with woody parts underground - rhyzomes) they creep getting larger with each year, making a larger clump which only gets more impressive, yet they sulk a bit when kept in nursery containers, which keeps the best garden varieties off of your big box retailers shelf, and most never even make it to the nursery. Epimediums are just grown and known by a few who know, but that shouldn't keep you from being one of them. All epidemics here are sold in deep, 2 inch pots which may not show what the plant will eventually look like in ones garden. Trust me, they are all beautiful and unique once planted in the ground. A spread for a Martha Stewart Living magazine feature from a couple of years ago shows the variety just within the foliage on some epidemic varieties. 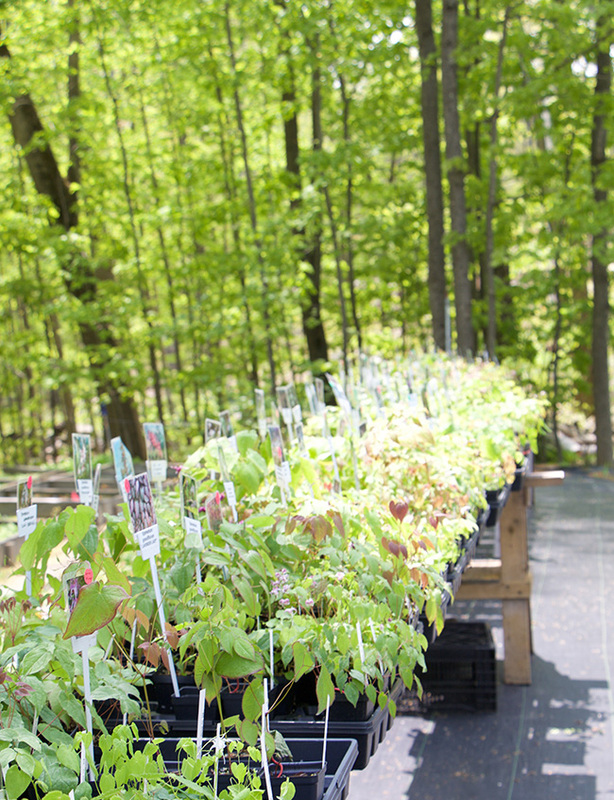 Garden Vision Epimedium's is one of those special 'one-of-a-kind' specialist nurseries worth supporting and adding to your sourcing list. Most of the varieties here were hybridized directly with the paintbrush and hands of the very person who collected the seed in the wilds of China - Darrell Probst. This means provenance, authenticity and that you are going to get a very, special plant - not just something micro-propagated in Holland and distributed by the millions around the world. 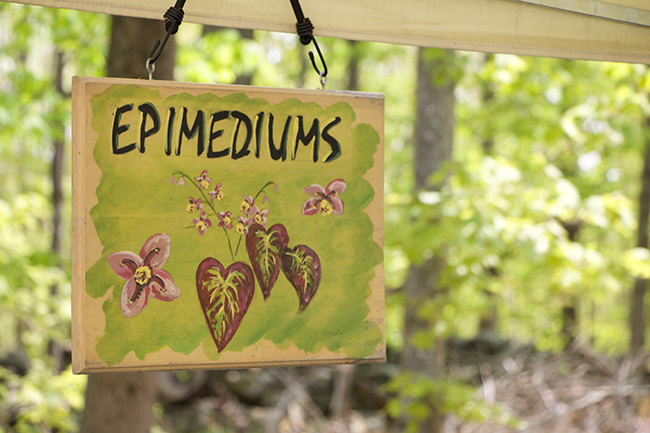 I had to ask Karen what her favorite Epimedium was ( always good to do while visiting a specialist nursery). 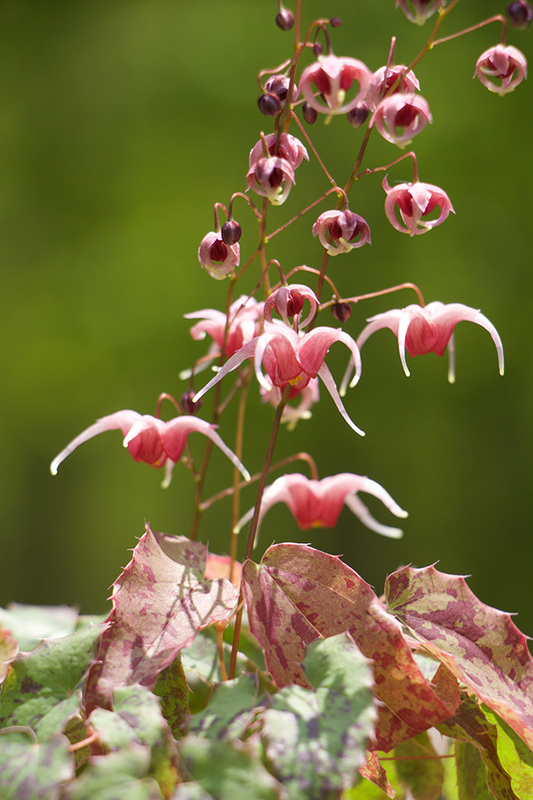 It was this delicate sweet thing - Epimedium x 'Windfire'. With very long flower spikes. 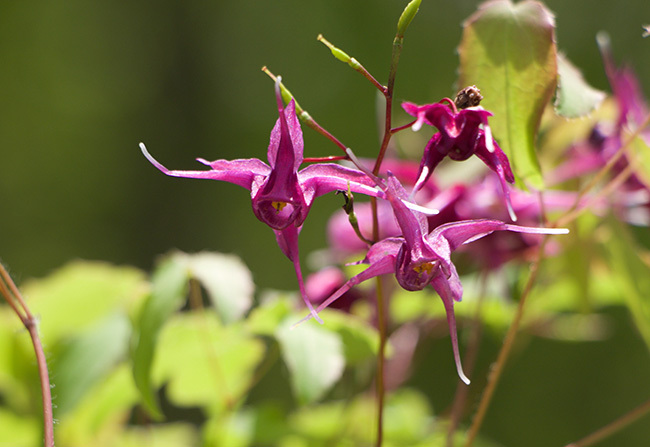 Epimedium grandiflorum 'Purple Prince' - perhaps the deepest purple blooms on any epidemic. 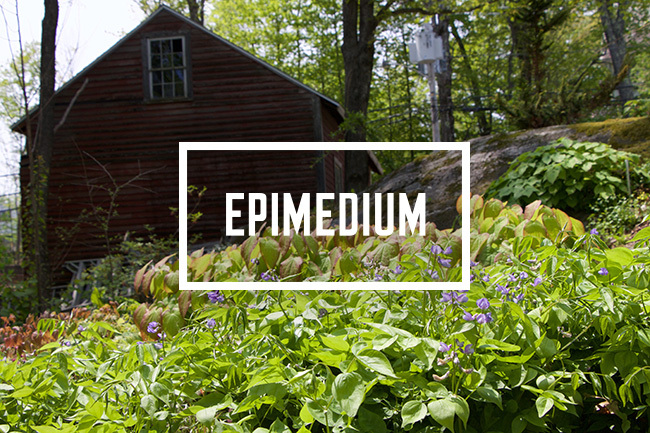 There are so many epidemics to get at Garden Vision Epimedium's that it can be difficult to choose just one. Epimedium grandiflorum 'Saxton's Purple', what at first looked similar to other purple epimedium varieties at the nursery, suddenly looked completely different once you compare them side-by-side. There are more than epidemedium species at Garden Vision. Both Karen and Darrell are part of a small, inner circle of plant collectors and explorers who often share both seed from their expeditions (often together such as Daniel Hinkley) but some of their favorite plants. Each here has a back story, and must be worthy enough to make it to a retail list. 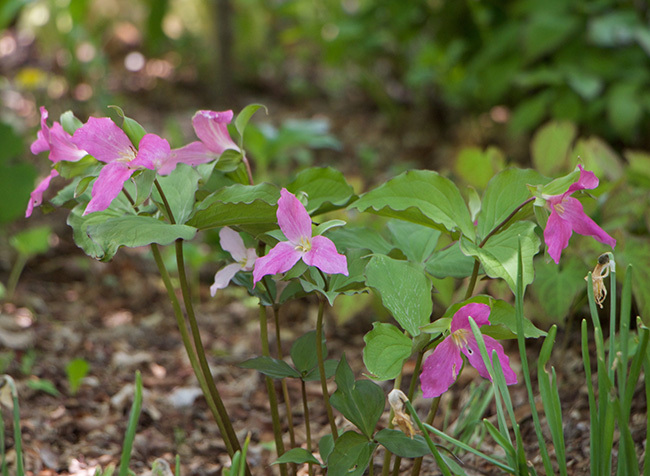 A very prolific rare Trillium pusillum 'Road Runner' forms a mat in the woodland garden. 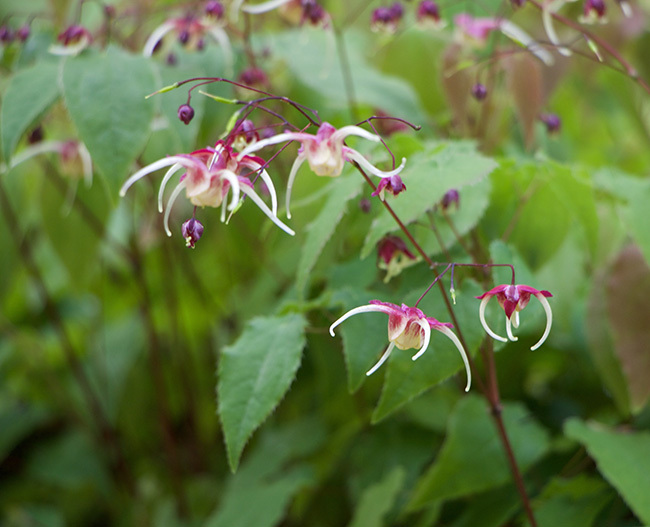 Not limited just to epimedium, Garden Visions also carries a selection of rare and unusual woodland plants and collector-worthy perennials. I particularly was drawn to a tiny Trillium pusillum, which formed a mat of color, even this late in the Trillium season. 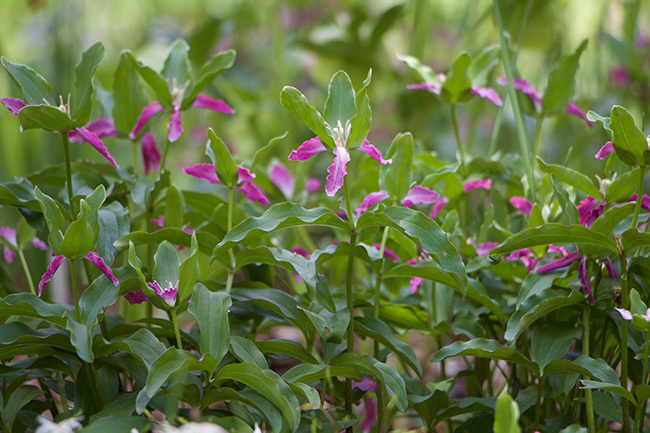 Tiny, if not minute, it put on a show worthy of a phlox with vibrant rose flowers - so odd, because not only is Trillium a notoriously slow to propagate genus, this species is typically white. Another nice trillium, T. grandifloras 'roses' . First blooms white, then turns rose. I found out later, that this, like many white Trilliums, ages to a rose color depending on night temperatures ( we have had a very cold spring), but that this also has a back story which you can read about here at the Joe Pye Weed nursery site. I should mention that part of the inner circle of friends here are the folks who own Joe Pye Weed - Jan and Marty are long time friends of Karen and Darrell, they are not only neighbors, but mutual friends of all of us, as well. (Get their catalog - download it here, especially since they specialize in breeding extraordinarySiberian Iris which I visited and wrote about here - The amazing Joe Pye Weed Siberian Iris). A nice species peony. 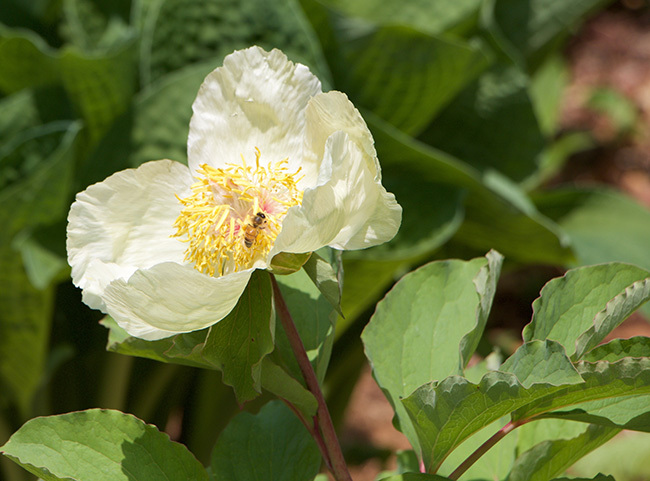 Known as 'Molly the Witch' by plant people, this is actually named by plant taxonomists with the mouthful of a name - Paeonia mlokosewitschii. 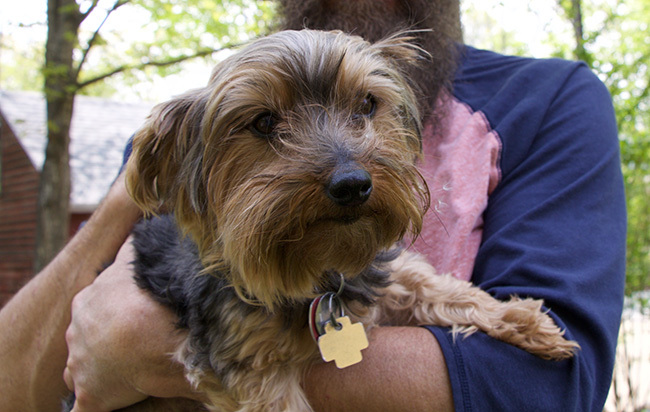 One of Karen's sweet pups gets some lovin' from Joe. I'm not sure if he liked it or not. 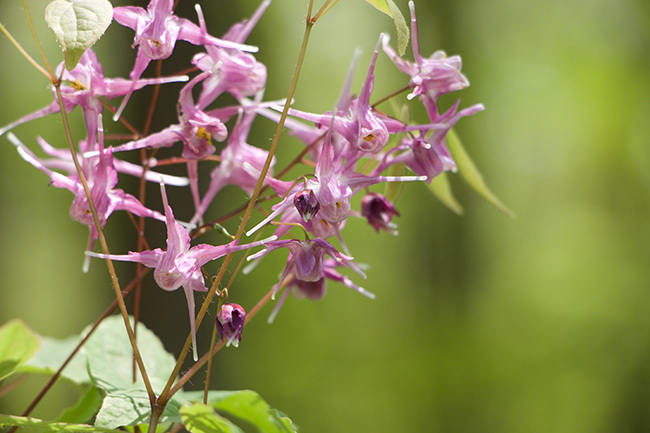 Your epimedium looks spectacular. We have one in our garden, I don't know what it's called. 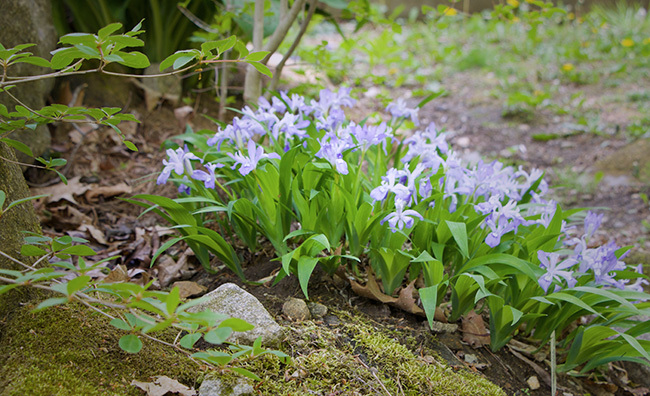 The foliage is beautiful but there are few flowers and they are small. Maybe I should try to grow another variety. thank you so much for this post and pix. they are certain to stimulate interest in this unaccountably overlooked genus and the fantastical offerings of garden vision. They do look irresistibly similar and yet different in the catalog! I too have never ordered, but still, circling enough as -must-get's. Still, the best way is to see them in person, in a garden after they have matured. They, the differences and nuances are very noticeable. Is there a way too send you a pic of a sproutling and have you identify it? Lol I've got something popping up and have no clue what it is. You probably know this but 'Pink Champagne' needs good drainage. I found out the hard way after a very rainy fall/winter in Seattle. Fred - I did not know this, so thanks for sharing! But I love that you have featured Karen's nursery. I have grown many of the more common epimediums for years and they have spread nicely and never waver in their delights. The six new ones I planted in the fall, procured from Karen, are doing very nicely in their first year of growth here. And I don't mind at all that they take their time to develop into a large spread. I appreciate that they're getting their underground parts well established for future appreciation above ground. Then they will always be there, probably long after I am gone! 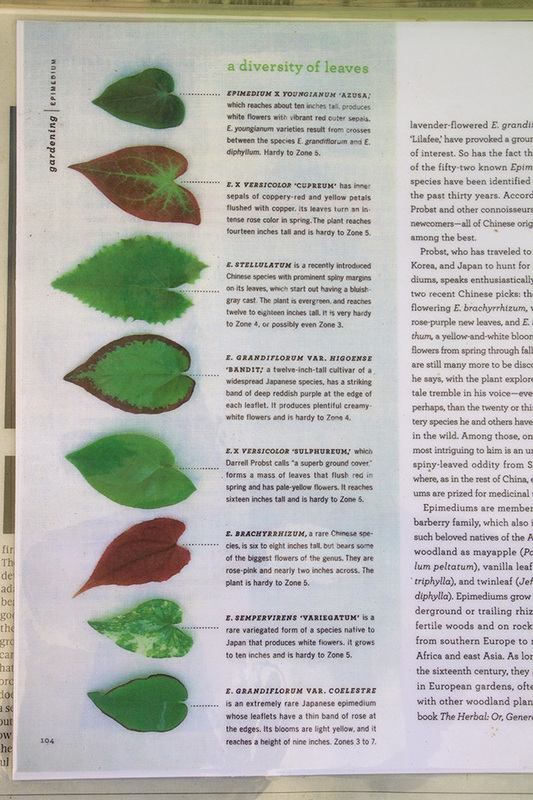 Ha - oh Elaine, just try typing in Epimedium - I am certain that spell-check kept creeping in and changing my copy! (Not that I can spell that good, anyway! ).